Michael Powell, a CTA conductor for 36 years, was known by commuters for his cheerful quips. Caroline Eichler, who asked about the super-friendly Red Line conductor. Editor’s note: The podcast episode available above includes two stories. The first looks at why Chicago is a transit hub for the Amish. The profile of CTA conductor Michael Powell begins at 7 minutes, 36 seconds. One of the first people Caroline came to recognize in the city was the voice of a certain chatty train conductor during her commute on the CTA’s Red Line from Rogers Park to the Jackson stop downtown. She remembers the conductor reminding passengers to grab their umbrellas if it was raining, or he’d jokingly advise passengers to take their children with them when they left the train. “One time he said ‘May the force be with you.’ That really cracked me up,” she says. Since Caroline only knew a handful of people in the city, even the more reserved announcements such as “I hope you’re having a great day!” were really nice, she says. Who is the super-friendly train conductor on the Red Line? While tracking down an answer, we learned that the man behind the kind words used the daily commute to comfort himself, too. The conductor is Michael Powell, who began working for the CTA in 1978. Getting a job with the CTA was “like a dream come true,” Powell says. He’s always loved trains, and he even had toy trains when he was growing up. Powell’s philosophy about relating to the passengers is straightforward. “I just try to make everybody feel good,” he says. Knowing people aren’t always happy to be on their way to work, he would sometimes give a morning pep talk. “Some people feel like they’re down in the dumps. They’re like ‘Wow-wee, I had to come to work today.’ And I sometimes say, Yeah, you know, it would be nice to stay home today, but we have to work. What’s for dinner tonight? Make sure you have everything with you! Just, you know, look on the bright side of life,” he says. Over the years Powell has made an impact on his passengers, and he’s been written about many times. When I first introduce him to Caroline, he presents a large binder full of his press clippings, print-outs of mostly-positive comment threads on articles featuring him, cards passengers had sent him, and comments people sent to the CTA. Caroline says she’s impressed with how much Michael’s comments resonated with people — enough that many people actually wrote to the CTA with positive feedback. “He brings out a good side of Chicago,” she says. Fans of Powell and his conversational style as a train conductor may be disappointed to learn that he retired at the end of 2013. He still spends time with a group of friends he calls “train club.” They get together once a week for breakfast, and they also run model trains and watch train movies together. Michael also became a grandfather this May. He misses seeing his passengers every day, “yet it’s nice to be a grandfather. It’s nice to spend more time at home,” he says. 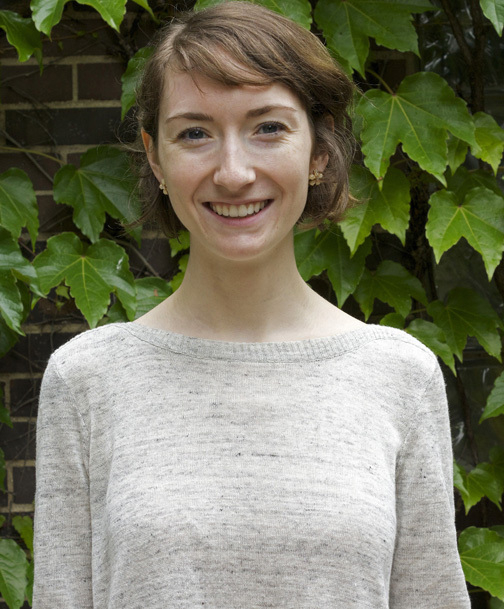 Caroline Eichler moved to Chicago in 2011, after graduating from Kenyon College. She quickly noticed Michael Powell’s distinctive style on the Red Line’s train announcements. Powell was a topic of conversation among her roommates as well. They would text each other when they caught Powell’s train on their morning or evening commutes. “I think I’m the most excited about it, but we’re all in on it together,” Caroline says. After three years, Caroline is more settled in the city; she’s involved in several musical endeavors, including working as the Music Librarian for the Civic Orchestra of Chicago. She’s also a violinist, and she sings with the vocal ensemble La Caccina. A version of this story originally aired on ChirpRadio.org. Katie Klocksin is a freelance radio producer. Follow her @KatieKlocksin.